Visa is a satirical play in Punjabi included in the book Dooja Passa (The Other Side) published in 1981 by Nanak Singh Pustakmala, Amritsar, India. The protagonist of the play is a rural Punjabi man and comes to New Delhi to obtain visa for Canada. He is overwhelmed by the traffic, high-rises, fastness, workings of the officials and can hardly utter a word as he faces and bribes corrupt officials at every step. He loses his clothes one by one and receives stacks of papers as he goes from office to office. At the end when he’s called into the final office to pick up his visa the official at the door tries to grab his underwear, the only piece of dress he is left with. The play lays bear the corruption prevalent in Indian bureaucracy. 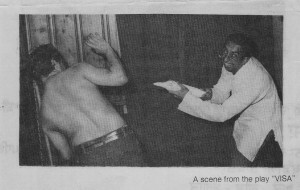 Visa was first staged, to a full hall, by IPANA (Indian Peoples Association in North America) in Carpenters Hall, Vancouver, in mid eighties, and was jointly directed by Dr. Hari Sharma and Ajmer Rode. 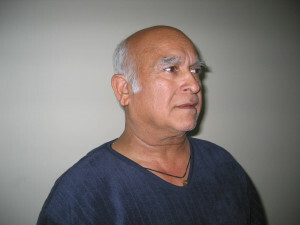 Veteran stage actor Gurcharn Dua played the protagonist. The Play was very successful and was thoroughly enjoyed by the audience. aGurchan in the Eighties office to obtain a Canadian visa (in India). 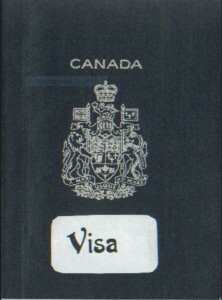 Visa has been staged in Canada and many times in Punjab, India. Visa was staged dozens of times in Chandigarh and other cities of Punjab by a Chandigarh theatrical company.